Hola. 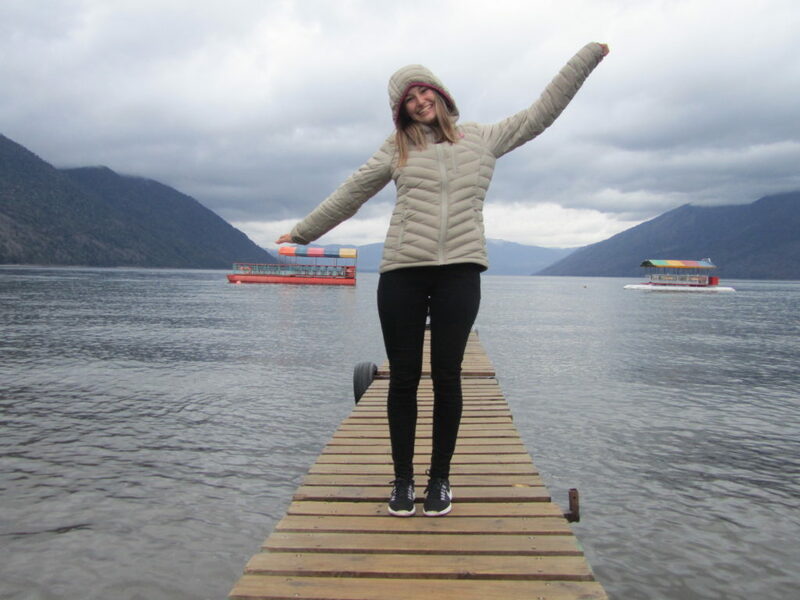 My name is Marlene, I am 18 years old and since almost 3 months an Au-Pair in Chile. My host family consists of a mother, a father, a 2 year old girl and two boys, 4 and 5 years old. We live in Chicureo, 20 km outsite of Snatiago, where at the moment several other Au-Pairs are placed. There also lives a housekeeper with us in the house who helps me with taking care of the children. Since the two boys go to a German school, it is also included in my tasks, next to taking care of the children in the afternoons, to speak German to them. I really enjoy when the children sometimes tell me something in German, and I do not have to ask again. The term „Au Pair“ is completely unknown in Chile. In case someone here asks you what you are doing in Chile, tell them „I live with a family and take care of their children and I try to teach them some German, while I learn Spanish“. The little Cristobal tells his friends that he has a Marlene at home, who takes care of him and plays with him as well that only he has such a Marlene. In these moments I am very happy and feel that I have a spot in the children’s hearts. The Chileans are very warm and helpful people and it does not take much time to find new „amigos“. I found this out when the best friend of my host mother, took me to a snowboarding trip to the andes. This was so much fun that we went again the next week and enjoyed the snow in 3000 meter heights. The country itself is very interesting and beautiful. I was with my host family for a few days in Villarica and Pucon, in the south of Chile. The habor city Valparaiso is also worth visiting. In these cities are lot of things to discover, which is why I go with my host family often on the weekends to Santiago to do some shopping. For the next weekends we already made plans to go visit other corners of Chile. I also already fell in love with the Chilean cuisine, which is why I definitely want to learn how to prepare some of these traditional meals before leaving again. Empanadas, filled steamed buns, Sopaipillas, a little bread made from pumpkin as well as Mote von Huesillos, a sweet juice with dried peaches and wheat. But my absolut favorite is Manjar, a cream from condensed milk and sugar, which reminds me of caramel. I got used to the chilean life style rather, the faily routine is very stress free and filled with chaotic situations and unpunctuality. The days in general are longer, because everything starts later. Bars and restaurants are only really croweded around midnight or even later. By now I can easily communicate with the children in Spanish, and I hope that this will even improve in the next 3 months, so I can also have better conversations with adults. In the beginning it is really hard to understand the Chilean spanish, because they use so many invented words and slang language, but after a while you get used to them. During the week I take care of the children in the house and on the weekends we visit family members of my host family or I meet some friends. Of course, sometimes the children can be exhausting, but when everything goes well and the children laugh much and you are having fun together, these days are more than worth it. Sometimes the girl put her fairytale books on my bed before saying good night, so that I also have some reading material. These gesture are certainly adorable. I am very happy to have made the decision to be an Au-Pair in the very diverse Chile. And I am super excited to see what the next 3 months are going to bring for me.